Patrick Gonzalez is a climate change scientist and forest ecologist. He conducts applied research on impacts of human-caused climate change and on ecosystem carbon solutions and works with national parks, policymakers, and local people to integrate climate change science into natural resource management. Patrick has conducted and published field research in Africa, Latin America, and the United States. He is coordinating lead author for the Southwest for the U.S. National Climate Assessment and is a lead author on three published and one forthcoming report of the Intergovernmental Panel on Climate Change (IPCC), the organization awarded a share of the 2007 Nobel Peace Prize. Human-Caused Climate Change in US National Parks, publication in Environmental Research Letters, September 24, 2018. Climate Change Scientist Walks the Walk, profile by Elizabeth Shogren, High Country News, August 22, 2016. Gonzalez, P. 1997. Dynamics of Biodiversity and Human Carrying Capacity in the Senegal Sahel. Ph.D. dissertation, University of California, Berkeley, CA. Dissertation Chair John P. Holdren. Gonzalez, P. 1992. New Directions and Old Lessons of Internationally-Financed Natural Resource Projects in Senegal. Report to the U.S. Agency for International Development. Energy and Resources Group, University of California, Berkeley, CA. Scott, J.M., R.S. Adamcik, D.M. Ashe, B. Czech, R.L. Fischman, P. Gonzalez, B. Griffith, J.J. Lawler, A.D. McGuire, and A. Pidgorna. 2007. Managing avian diversity in the face of global climate change: The case of the National Wildlife Refuge System. Cooper Ornithological Society, 77th Annual Meeting, Abstracts, p. 58. Griffith, B., J.M. Scott, P. Gonzalez, and R.P. Neilson. 2007. Climate induced biome shifts and their implications for management of trust species of the National Wildlife Refuge System. Cooper Ornithological Society, 77th Annual Meeting, Abstracts, p. 41. Shlisky, A., J. Waugh, P. Gonzalez, M. Gonzalez, M. Manta, H. Santoso, E. Alvarado, A.A. Nuruddin, D.A. Rodríguez-Trejo, R. Swaty, D. Schmidt, M. Kaufmann, R. Myers, A. Alencar, F. Kearns, D. Johnson, J. Smith, and D. Zollner. 2007. Fire, ecosystems and people: Threats and strategies for global biodiversity conservation. Proceedings of the Fourth International Wildland Fire Conference, TS3. Tucker, C.J., A. Anyamba, and P. Gonzalez. 2005. Monitoring of land degradation and desertification dynamics using coarse-scale satellite data. In A. Röder and J. Hill. Proceedings of the 1st International Conference on Remote Sensing and Geoinformation Processing in the Assessment and Monitoring of Land Degradation and Desertification. Universität Trier, Germany. Gonzalez, P., H. Sy, and C.J. Tucker. 2004. Local knowledge and remote sensing of forest biodiversity and forest carbon across the African Sahel. In A.M. Lykke, M.K. Due, M. Kristensen, and I. Nielsen (eds.) Proceedings from the 16th Danish Sahel Workshop. Sahel-Sudan Environmental Research Initiative, University of Copenhagen, Denmark. “Scientists: Vegetation Zones Are Shifting,” article by Aaida Samad, Daily Californian, June 10, 2010. “Shift in Earth’s Vegetation,” interview by Melissa Culross, KCBS Radio, San Francisco, California, June 6, 2010. 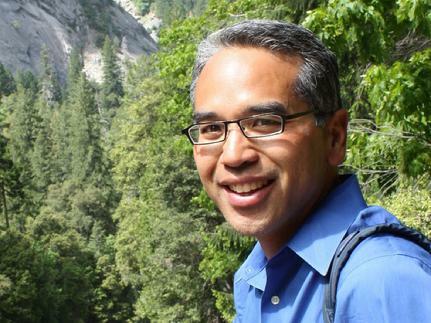 “Forest Ecologist Patrick Gonzalez,” profile by Brenda Wilson, Cool Careers in Environmental Sciences, Sally Ride Science, San Diego, California, 2010. “Global Warming,” radio interview by Ed Baxter, KGO radio, San Francisco, California, May 30, 2008. “Up Close with Patrick Gonzalez,” profile by Courtney Leatherman, Nature Conservancy 52 (2): 18-19, Summer 2007.